Can Auto Makers Really Achieve 54.5 MPG CAFE by 2025? The loud fight in the U.S. Congress over raising the national debt ceiling drowned out the announcement, but in late July, the Obama Admin. sealed an agreement with 13 major auto makers to implement the largest mandatory U.S. fuel-economy increase in history. The proposal, expected to be finalized in September, mandates U.S. cars and trucks to average 54.5 mpg (4.3 L/100 km) by 2025. But this begs the question: Now that politicians, environmental groups and most top auto maker executives have signed on, can it really be done? More importantly, can auto makers hit the target and still offer vehicles that are safe, roomy and affordable? The good news is that in stark contrast to the debt ceiling battle 54.5 mpg represents what looks like a reasonable compromise between warring combatants. Environmentalists were pressing for a 62-mpg (3.8 L/100 km) standard, while most auto makers were lobbying for a fleet fuel-economy average closer to 47 mpg (5.0 L/100 km). The ability of auto makers to meet these targets was bitterly debated, with each party armed with their own supporting studies, forecasts and sometimes questionable data. Much lobbying and politicking continues behind the scenes, but on the day of the historic announcement, it mostly was smiles all around as industry executives and green groups lauded the accomplishment. Some environmentalists, and a few auto makers that do not sell a lot of fullsize pickup trucks, complain the compromise requires cars to log 5% annual fuel-efficiency gains while light trucks get off too easily. The heaviest light trucks carry no burden until the 2017-2020 timeframe, thanks to various loopholes, critics argue. Volkswagen has gone public with this objection, along with its complaint that the fuel-economy advantages of clean diesels are completely ignored by the proposed fuel-efficiency rules. But most environmental groups are outwardly pleased by the outcome, despite having to give some ground. Dan Becker, director of the Safe Climate Campaign for the Center for Auto Safety, was conciliatory when he addressed an auto industry conference in early August. Charlie Klein, director-Global Mass, Energy and Aerodynamics at General Motors, also is upbeat about the rules and says the new efficiency targets provide regulatory certainty to the industry. But he also admits it remains unclear how the industry will meet them 14 years from now. By most accounts, hitting an average of 54.5 mpg is a tall order. 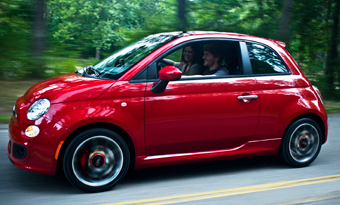 The ’12 Fiat 500, for example, weighs just 2,400 lbs. (1,089 kg), has a tiny back seat and is powered by a conventional 1.4L 101-hp 4-cyl. engine. Its 30/38 mpg (7.8-6.1 L/100 km) city/highway fuel economy yields a combined 33 mpg (7.1 L/100 km). That is a long way from the target. Driving an even smaller, lighter and lower-powered car to obtain better efficiency would not be desirable to a typical U.S. consumer. Yet, advocates for even more stringent standards point to the Toyota Prius hybrid-electric vehicle rated at 51/48 mpg (4.6-4.9 L/100 km). They say its combined 50 mpg (4.7 L/100 km) rating shows 54.5 mpg should be easy to hit in 14 years. And many experts say concerns about tougher CAFE standards harming safety are overblown. The way the rules are structured, they actually limit the possibility of vehicle safety being compromised, says Adrian Lund, president of the Insurance Institute for Highway Safety. That’s because all vehicle sizes now must become more efficient. The system can’t be “gamed” by building some tiny cars to compensate for big gas guzzlers. The increasing use of electronic active safety devices also promises to improve vehicle safety without hurting fuel economy, says Thomas Broberg, a senior technical advisor for safety at Volvo. Auto makers will hit the 2025 CAFE target simply because they have a long history of always meeting government mandates, after initially resisting them, the Center for Auto Safety’s Becker says. Even Fiat and Chrysler CEO Sergio Marchionne recently admitted auto makers “have cried wolf too often,” when confronted with new government standards, Becker says. But those on the other side of the argument say environmentalists and government are placing too much faith in the ability of technology to enable big leaps in fuel economy, and in consumers’ eagerness to pay for it. Sean McAlinden, chief economist and executive vice president of research at the Center for Automotive Research, says the Obama Admin.’s understanding of automotive technology is flawed and that it is cherry-picking data from studies particularly favorable to its views. Citing a recent CAR study, McAlinden says even the compromise 54.5-mpg mandate will make new vehicles unaffordable to many more Americans and essentially kill off the fullsize American pickup, taking tens of thousands of good-paying jobs along with them. Almost 1,100 automotive engineers and designers responding to a recent WardsAuto survey largely agree with McAlinden’s assessment. The survey was conducted several weeks prior to when the originally proposed target of 56.2 mpg (4.1 L/100 km) was negotiated down to 54.5, but the engineers and designers raise similar concerns regarding safety, higher costs and negative consumer reaction. The concurrence especially is apparent in views about how lightweight materials can be used to improve fuel economy. While ultra high-strength steels, aluminum, magnesium and plastics and composites all offer great potential to further improve fuel economy, government studies vastly underestimate the cost and difficulty associated with reducing mass by transitioning to these new materials, McAlinden says. In the WardsAuto survey, only 5% of respondents express confidence in the currently available materials portfolio’s ability to meet future CAFE demands. That’s because every major automotive material has specific drawbacks, engineers say. Advanced high-strength steels are stronger and can be formed into thinner, lighter-weight structures than conventional steels, but they can be more difficult to shape and fabricate into structural parts and body shells. Aluminum is lighter than steel, but it is more expensive and requires different welding and forming techniques. Magnesium is substantially lighter than aluminum, but it is even more costly and limited in availability. There literally is not enough magnesium being produced in the world today to support a major automotive lightweighting effort with the material, McAlinden says. Carbon-fiber composites are ultra strong and the lightest of all alternative materials, but high costs and slow manufacturing processes until recently have limited their use to mostly racing machines and ultra-expensive supercars. Energy costs and high carbon-dioxide output related to the fabrication of carbon-fiber parts also are hurdles to higher production use. Last year, BMW and materials supplier SGL announced SGL Automotive Carbon Fibers, a new joint venture that will build a state-of-the-art carbon-fiber manufacturing plant in Moses Lake, WA. It is a $100 million investment. The new facility is an important element of both companies’ strategy to commercialize viable manufacturing of ultra-lightweight carbon-fiber-reinforced plastics for use in future vehicles. The fibers manufactured at Moses Lake will be used exclusively for BMW’s upcoming ultra-green Megacity vehicle. The facility uses hydropower, negating the concern of creating excessive CO2 emissions from manufacturing carbon fiber. SGL Automotive is cutting the costs of making carbon fiber by switching to a lower-grade material that takes less than half the time to prepare and is just as effective, Managing Director Joerg Pohlman says. The lower-grade material is one-third the cost per-kilogram of the carbon fiber currently being used on the roof of BMW's M3 coupe, Pohlman says. "There's still a lot of potential in the future to bring it down even further," Pohlman says. But a peek at the construction of the ’12 Audi A6, one of the most technically advanced mass-produced cars of the new model year, shows how challenging it can be to create a luxury car that is lightweight and fuel-efficient but still possesses the dynamic performance and amenities buyers require. The A6’s aluminum/steel hybrid structure is 20% aluminum by weight and loaded with dozens of parts and components made from the light metal. There are aluminum strut mounts at the front of the car that are castings, struts in the engine compartment and cross members behind the bumpers. The front fenders, hood, rear hatch and numerous other major structural parts are made from the light metal. Despite the extensive use of aluminum, the car still weighs 4,045 lbs. (1,835 kg) about 78 lbs. (35 kg) less than its predecessor. To engineers, a 78-lb. reduction is an enormous achievement, but as a step to 54.5 mpg, it is a tiny one. Despite all its sophistication, the A6 still is 51.8% steel by weight. A typical family sedan is about 58% steel, according to an analysis by Ducker Worldwide. Powered by a 211-hp gasoline direct-injection 2.0L turbocharged 4-cyl. engine, the A6 gets 25/33 mpg (9.4-7.1 L/100 km) or 28 mpg (8.4 L/100 km) combined. Base price is $42,600. If more lightweight materials and efficiency-enhancing technology is added, the price has nowhere to go but up. The Audi A8 luxury sedan, which features an all-aluminum body, starts at about $80,000. In the WardsAuto survey, respondents identify the need for higher-strength, lighter metals including aluminum, magnesium and more cost-effective advanced composites for structural components that can significantly reduce weight. They also say they need more high-heat resistant, lightweight materials to withstand higher combustion pressures and temperatures. All the major materials suppliers are hoping to rise to the occasion. Last year, DuPont launched more than 1,700 new products and invested 22% of its $1.7 billion research and development budget on reducing dependence on fossil fuels, new chemistry and materials, the supplier says. DuPont is working especially in areas where it can reduce weight and friction at low cost and improve the efficiency of battery packs and power-delivery systems for hybrid-electric vehicles and EVs. Clearly feeling the heat from the lighter-weight competition, steel makers also are working double-time to hang onto their roughly 50% share of most vehicles. ArcelorMittal, the world's largest producer of automotive steel, showed off a series of advanced steel grades and processes earlier this year, hoping to stop interlopers in their tracks. “The goal is not to lose one pound to alternative materials,” says Greg Ludkovsky, vice president-Global Research and Development. Ludkovsky outlines a near-term product strategy that he says can chop the weight of a typical C-segment car 14%, equivalent to 125.7 lbs. (57 kg), and major body-in-white structural parts 20%, or 77 lbs. (35 kg), without adding cost. This product lineup, dubbed S-in motion, features new steel grades that are available for automotive production or soon will be. Many of these advanced grades likely will show up in new vehicles being developed now and going into production in about 2016, but some could be adopted immediately as part of a running change, Ludkovsky says. However, the steel maker now is developing next-generation “breakthrough products” that will be equivalent to aluminum in weight and provide an additional savings of 64 lbs. (29 kg) in a typical C-segment car, he says. While steel clearly is in the crosshairs of every engineer looking to reduce weight and improve fuel economy, Jody Shaw, director-technical marketing at United States Steel, says his material is holding its own as auto makers and governments begin applying more comprehensive analysis to vehicle emissions. Increasingly, auto makers are applying total-lifecycle analysis to their evaluation of automotive materials, which includes energy used and CO2 emitted during a vehicle’s manufacture, use and ultimate recycling. And when it comes to greenhouse-gas production during manufacturing of primary materials such as steel, aluminum, magnesium and carbon-fiber reinforced plastics, steel produces a fraction as much as its competitors. As the population of extremely fuel-efficient and electrified vehicles grows, and operating emissions begin to decline, the amount of CO2 produced during a vehicle’s manufacture will become a more important part of the overall life-cycle analysis equation, and continue to provide steel with an advantage in the long term, Shaw says. Ultimately, the question of whether auto makers can hit the 2025 target does not have to be answered just yet. There will be a “midterm review” in the spring of 2018 for auto makers and environmentalists to restate their cases and refight their battles as the marketplace changes and technology evolves. But at this point, all parties seem to concur that having an agreement, no matter how sketchy or flawed, is far better than having no agreement at all.